Premises: The Lot, including the Building containing approximately _________ rentable square feet as shown on Exhibit A. commonly known as _____________ (the Building). Commencement Date: Upon Substantial Completion of Lessee Improvements but in no event later than four (4) months following full execution and delivery to Lessee of the Lease. Insurance Amount: Bodily injury limit of not less than $3,000,000 per occurrence. Property damage limit of not less than $3,000,000 per occurrence. This Lease is made and entered into as of the Lease Date defined on Page 1. The Basic Lease Information set forth on Page 1 and this Lease are and shall be construed as a single instrument. Lessor hereby leases the Premises to Lessee upon the terms and conditions contained herein. 1. TERM AND ADJUSTMENT OF COMMENCEMENT DATE: The Term of this Lease shall commence the Commencement Date, subject to Paragraph 4 and the Basic Lease Information, hereof, and shall expire on the last day of the _______________ (th) month after the Commencement Date (the Expiration Date), unless earlier terminated pursuant to the terms hereof. If Lessor cannot deliver possession of the Premises on the Commencement Date. Lessor shall not be subject to any liability nor shall the validity of the Lease be affected; provided the Lease term and the obligation to pay rent shall commence on the date possession is tendered and the termination date shall be extended by a period of time equal to the period computed from the Commencement Date to the date possession is tendered. Lessor and Lessee agree to execute and deliver a completed Commencement Date Memorandum in the form attached hereto as Exhibit D and made a part hereof promptly after the Commencement Date. 2. 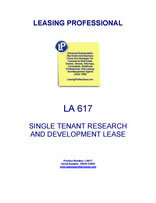 RENT: Lessee agrees to pay Lessor in lawful money of the United States, without prior notice, abatement, claim, offset or demand, the Base Rent described in Exhibit B and Page 1, payable in advance at Lessor’s address shown on Page 1, on the first day of each month throughout the term of the Lease. All amounts which Lessee is obligated to pay to Lessee under this Lease, in addition to Base Rent set forth on Page 1, including, without limitation. Lessee’s Share of Operating Expense, Lessee’s Share of Tax Expense and Lessee’s Share of Utilities as specified in Paragraph 5.A., 5.B., and 6. of this Lease, shall constitute Additional Rent and the term Rent whenever used herein refers to all of these amounts, as well as the Base Rent. A. Pursuant to the work letter attached hereto as Exhibit B and made a part hereof (the Work Letter). Lessor shall (i) have certain Lessee improvements constructed in the Premises (the Lessee Improvements), and (ii) provide Lessee with an improvement allowance of _________________ (the Lessee Improvement Allowance) for the Lessee Improvements. Lessee may elect to increase the amount of the Lessee improvement Allowance in accordance with the provisions set forth in the Work Letter. B. Lessor warrants that upon delivery of possession of the Premises (i) the Lessee Improvements shall be Substantially Complete (as defined in the Work Letter), (ii) the HVAC system, the sprinkler system and all other mechanical systems of the Premises (including electrical and plumbing) will be in good working condition and (iii) the Premises will be in water tight condition. Except for the Lessee Improvements contemplated by the Work Letter, the matters described in clauses (ii) and (iii) immediately above, and Lessor’s limited repair and maintenance obligations expressly set forth in this Lease. Lessee agrees to accept the Premises in its present as is condition, and Lessor shall have no obligation to install, construct, or otherwise make any other improvements to the Premises. Notwithstanding any provision in the Lease to the contrary, in the event any code compliance work is or becomes necessary as a result of the Lessee Improvements, including, without limitation, any work necessary to comply with the ADA, or city building codes, and the Lessee Improvement Allowance is not sufficient to cover the cost of such compliance work, the cost of such compliance work shall be borne by Lessee. Lessee acknowledges that neither Lessor nor any agent of Lessor has made any representation or warranty with respect to the Premises, the condition of the Premises, the parking area surrounding the Premises, or any portions thereof, the availability of additional parking, or with respect to the suitability of the Lot for the conduct of Lessee’s business. (h) Lessor’s cost of all common area maintenance, utility and other costs for the Lot. B. Tax Expense: In addition to the Rent set forth in Paragraph 2, Lessee shall pay its share, which is defined on Page 1, of all real property taxes applicable to the land and improvements included within and upon the Lot (Tax Expense). The term Tax Expense includes any form of tax and assessment (general, special, ordinary or extraordinary), commercial rental tax, payments under any improvement bond or bonds, license, rental tax, transaction tax, levy, or penalty imposed by authority having the direct or indirect power of tax (including any city, county, state or federal government, or any school, agricultural, lighting, drainage or other improvement district thereof) as against any legal or equitable interest of Lessor in the Premises, Lot or Park, as against Lessor’s right to rent or other income therefrom, or as against Lessor’s business of leasing the Premises or the occupancy of Lessee or any other tax, fee, or excise, however described, other than inheritance or estate taxes, including any value added tax, or any tax imposed in substitution, partially or totally, of any tax previously included within the definition of real property taxes, or any additional txt the nature of which was previously included within the definition of real property tax. C. Payment of Expenses: Lessor shall estimate the Operating Expense and Tax Expense for the calendar year in which the Lease commences. Commencing on the Commencement Date, one-twelfth (1/12th) of this estimate shall be paid by Lessee to Lessor on the first day of each month of the remaining months of the calendar year. Thereafter, Lessor may estimate such expenses as of the beginning of each calendar year and require Lessee to pay one twelfth (1/12th) of such estimated amount as additional Rent hereunder on the first day of each month. On or about March 31 of the following calendar year, or as soon thereafter as reasonably possible, including the year following the year in which this Lease terminates, Lessor shall endeavor to furnish Lessee with a true and correct accounting of actual Operating Expenses and Tax Expenses, and within thirty (30) days of Lessor’s delivery of such accounting, Lessee shall pay to Lessor the amount of any underpayment, provided that such accounting is furnished to Lessee not later than the end of the calendar year subsequent to the year for which the accounting was made. Notwithstanding the foregoing, failure by Lessor to give such accounting by such date shall not constitute a waiver of Lessor of its right to collect Lessee’s share of any underpayment. Lessor shall credit the amount of any overpayment by Lessee toward the next estimated monthly installment(s) falling due, or where the term of the Lease has expired, refund the amount of overpayment to Lessee within ninety (90) days.